What ails India’s public health system? New Delhi: Four days after his newborn twins were admitted to the neonatal intensive care unit at BRD (Baba Raghav Das) Medical College in Gorakhpur, Uttar Pradesh, Brahmdev, a farmer from the nearby village of Bagadada, realized something was wrong with the treatment being given to his children. He began to panic when he noticed a dip in the oxygen supply to the ailing children—soon after the hospital staff directed him to manually pump oxygen by a ventilation device. Within a few hours, the 10-day-old boy and girl had died, leaving Brahmdev and his wife Suman shell-shocked. This was 10 August. The farmer couple was not the only mourners in the ward that day. A number of the newborns there had now become part of a heart-wrenching statistic: 30 children dead in a span of two days, believed to be because of a cut in the supply of oxygen cylinders by the vendor the hospital used, over non-payment of dues. Brahmdev and Suman were two among the latest victims of the endemic failure of procurement management in the Indian public health system. The central government, which has the declared aim of achieving Universal Health Coverage (UHC) by 2022, has failed to maintain a reliable and constant supply of consumables, diagnostics and other technologies, which leads to incidents like mass infant deaths in Gorakhpur. The healthcare budget remains extremely low in India. The total spending on healthcare in the country makes up just 1.2% of gross domestic product (GDP), even though the government’s Draft National Health Policy 2015 envisages progressively raising public health expenditure to 2.5% of GDP. Of the budget allocated for healthcare, about 26% is spent on procurement of drugs, vaccines and medical supplies. In 2016-17, the health budget was around Rs33,000 crore. The central health ministry spent Rs8,580 crore on procurement. In 2017-18 the overall budget increased to Rs37,471 crore, while procurement went up to Rs9,742 crore. Health economists say that achieving UHC would require an additional purchase worth Rs24,000 crore. Already struggling with low budgets, a dearth of expertise and embedded corruption in the layered public procurement system, India’s government hospitals are unable to provide effective healthcare to the poor, who are compelled to turn to them in times of need. The ministry of health and family welfare procures drugs, vaccines, contraceptives and medical equipment for many programmes such as the Revised National Tuberculosis Control Programme, National Vector Borne Disease Control Programme, Universal Immunization Programme, National Family Planning Programme, Reproductive and Child Health Programme, and National AIDS Control Programme. The problem arises because health financing is an opaque activity, as money, drugs, vaccines and equipment move from the centre to the states (and vice versa). The inefficiency in the procurement process results in both shortages and wastage. When this happens in the field of health, the results can be disastrous, even leading to deaths that can be avoided. There are further complications: inaccurate quantification, delays in tender decisions, payment delays and inadequate monitoring. The latest report (2015-2016) of the Central Medical Services Society (CMSS), an autonomous body under the ministry of health and family welfare that handles procurement, supply chain logistics and health sector supplies, disclosed that there are several deficiencies in the procurement of various healthcare items. Though programme divisions interacted with state programme officers on every aspect of implementation, the timely supply of drugs, vaccines and contraceptives remained a major concern at the state level. The report identified deficiencies in the system of procurement of health sector goods. “There was an absence of supply chain management. There was inadequate supply chain infrastructure and quality control. There is manual collection of data and absence of any credible Management Information System for proper stocking and inventory management. There is inadequate professional procurement expertise in the Health Ministry, and delays in estimation of quantities and in settlement of tenders, leading to delayed supplies. In view of these deficiencies, the supply of vaccines, contraceptives and drugs has been irregular, with excesses in some places and shortages at others across the country, thereby affecting programme effectiveness," pointed out the report. Public procurement policy experts say that there is a dire need to have procurement specialists in government hospitals. “There is no public procurement law in India. It is governed by a set of guidelines," said Girish Bhatnagar, procurement policy consultant at the procurement policy division of ministry of finance. Bhatnagar also consults with the World Bank on procurement policy. “In hospitals which must have procurement experts, doctors have been given the role of procurement officers. A doctor’s sole job is to concentrate on patients and research." The 2016-17 annual audit report of the Union health ministry pulled up the central government-run Dr. Ram Manohar Lohia (RML) Hospital in New Delhi for blocking funds and non-utilization of equipment. “The Ministry, without ensuring readiness of infrastructure, went ahead and procured various medical equipment valued at Rs15.93 crore for the Emergency Care Centre in RML Hospital. Two pieces of equipment, valued at Rs2.40 crore, could not be put to use as of December 2015. RML also failed to exercise due diligence in procurement of X-ray film, leading to procurement at higher rates." As the infant deaths in Gorakhpur made clear, the functioning of health authorities in state governments is even worse. The Comptroller and Auditor General of India, (CAG) in a June 2017 social sector performance report on Uttar Pradesh, found several irregularities in the procurement of equipment in the past five years. Take BRD Medical College, where the infants’ deaths occurred in August. All the way back in June, CAG found that though BRD hospital had Rs27.38 crore to spend, there was a of 27.21% shortage of clinical equipment and 56.33% of non-clinical equipment against the minimum requirement prescribed by the Medical Council of India. “The parking (not spending) of funds not only violated the financial rules but also deprived patients of adequate healthcare as essential equipment could not be procured on time…," said the CAG report. Similarly, the CAG report for 2014-15, tabled in the Delhi Assembly in June 2016, criticized Delhi’s health department, arguing that a comprehensive procurement policy for medical equipment was lacking. The report found a delay of up to two years in procurement and delivery of medical equipment. The situation in the supply of medicines, vaccines and contraceptives across the country is no different. “We are in constant consultation with the states to improve procurement systems in healthcare," said Sudhir Kumar, joint secretary in the economic advisory department of the central health ministry. “We are attempting to introduce e-tendering across the country, and direct transfer of payment into the bank account of the vendor or service provider to maintain transparency and avoid delays in service delivery." The health ministry has identified the problems in procurement management; but it has not been able to find a solution due to the complexity of the existing system. “The procurement of various items, ranging from medicines to medical devices and services, is done in various ways which are not linked with each other," said a senior official in the health ministry who requested anonymity. At the state and district levels, procurement of various services is under the National Rural Health Mission. The ministry procures some services directly. In addition, different government hospitals have their own procurement systems, through open tender, rate contract and emergency procurement. “Some departments procure medical items, vaccines, drugs and services through a procurement agency that charges 2% commission," the official cited above explained. “There is often overlap, because there are different programmes running for the same diseases, such as vector-borne diseases, HIV, tuberculosis, for which medicines and testing kits are procured. The major problem is that nobody keeps a tab on the stocks in hospitals and programmes. There is a lack of transparency about who is procuring what. There are delays in payments and delivery to states. There have been cases where payments and delivery of essential items and services has taken anywhere between six months and one year." “Transparency should be maintained in financial processes," said Dr Raj Panda, additional professor and senior public health specialist at Public Health Foundation of India. “Introduction of a functional and online MIS (management information systems) can help in tracking the drugs and their timely storage across various warehouses. This contributes to strengthened and well-regulated procurement procedures. Robust data management systems should be in place to track inquiries regarding smart cards, payment approval, patients’ records and utilization rate." 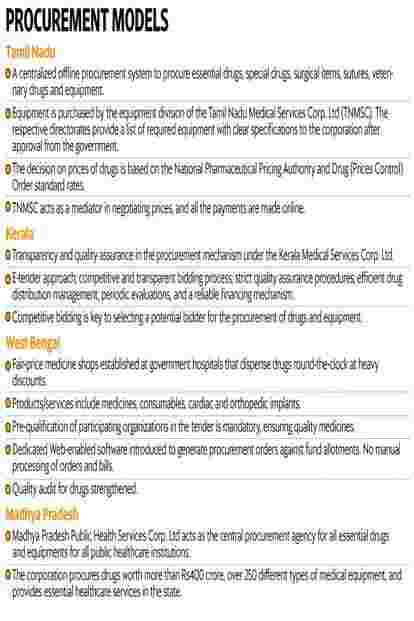 In a bid to eliminate inefficiencies in procurement, CMSS officials recommend setting up a central procurement agency along the lines of the Tamil Nadu Medical Services Corp. Ltd (TNMSC), which has performed well in the last 15 years. Some other states, such as West Bengal, Madhya Pradesh and Kerala, also have procurement models that are considered best-in-class. Tamil Nadu follows a centralized offline procurement system to purchase essential drugs, specialty drugs, surgical items, sutures, veterinary drugs and equipment. TNMSC acts as a mediator, negotiating prices. The government of Tamil Nadu sanctions a specific annual budget, with no provision of advance payments. The payment is made after half the ordered quantity is received. Equipment is only paid for after the purchased item is installed properly at the required premises. All payments are made online. All branded drugs are procured centrally, through direct negotiations with the manufacturers. These negotiations are based on current market prices and quoted rates. Essentials drugs are supplied free of cost to all public healthcare facilities, while other drugs are sold at subsidized rates through centres at government health institutions. Kerala Medical Services Corp. Ltd (KMSCL) is yet another efficient procurement system, with a coherent decision-making structure and strict regulatory systems. “Transparency and quality assurance are central to the procurement mechanism under KMSCL," said Panda. “An efficient procurement mechanism is further supported by e-tenders. There is a competitive and transparent bidding process, strict quality assurance procedures, efficient drug distribution management, periodic evaluations and a reliable financing mechanism." Madhya Pradesh Public Health Services Corp. Ltd is a public corporation that acts as the central procurement agency for essential drugs and equipment for public healthcare institutions in the state. The company is also entrusted with setting up and running medical and paramedical ancillary facilities such as hospitals, pathological labs, diagnostic centres and X-ray facilities. The West Bengal government saved more than Rs706.34 crore by adopting a fair procurement system in 2014 that included free drug facilities, a fair price medicine shop, free diagnostic facilities and dialysis services. It did so through a public-private partnership. A dedicated Web-enabled software, Store Management Information System, was introduced to generate procurement orders against fund allotments. Manual processing of orders and bills has been disallowed in the state. The World Health Organization advocates “strategic purchasing" to improve the performance of health systems through effective allocation of funds to healthcare product and service providers. It entails deciding which healthcare interventions need to be purchased given population needs, national health priorities and cost-effectiveness. The Association of Indian Medical Device Industry (AIMED) has been urging the government to move away from so-called L1 procurement, under which the supplier who quotes the lowest price is given a contract. It wants preference to be given to indigenous suppliers who use higher domestic content in their products and recommends penal action against those with a poor delivery record. Indian Certification for Medical Devices, quality assurance certification from the Quality Council of India and design India certification from the department of industrial policy and promotion should be used as the criteria for deciding who gets a contract. “Major lapses in the procurement policy of most of the state governments are due to separate funding allocation for different medical colleges/hospitals due to which medical colleges and hospitals have to call for local tenders as well as for local purchases, depending upon the availability of the funds," said Rajiv Nath, forum coordinator at AIMED. “This usually encourages a system which is non-transparent and many times more favourable for a few suppliers, which may compromise patient safety and health." To avoid incidents like the mass infant deaths in Gorakhpur, hospital authorities should make sure they have specialists to periodically assess the medical supplies they require and procure them in time, said procurement policy consultant Bhatnagar.